KOKOMO, Ind. 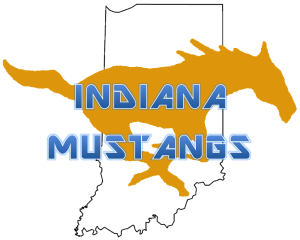 – The Indiana Mustangs (4–3) semi-professional football team will host the Chicago Thnnder (6–2) on Saturday, Sep. 22, 2012, at Indianapolis Park Tudor High School (7200 N. College Ave.). Kickoff is scheduled for 8 p.m.
Members of the Crossroads of America Council Cub Scout Pack #16. based out of the Irvington Community School District, will serve as honorary captains for the game. Tickets are $8 for adults and $3 for students/seniors. Children six and under and all military personnel receive free admission by showing their military identification. The Mustangs won the Southeast Division of the Mid-States Football League and received a first-round bye in the playoffs last week. The Chicago Thunder are coming off a dominating 42–6 win over the Joliet Buccaneers. The Thunder are one of the most successful teams in the league and they have won four league championships, more than any team in league history. The Thunder and Mustangs have only played once, back in 2004, and the Thunder defeated the Mustangs enroute to the Mid-States Football Championship and an undefeated season. The Thunder are well-coached, well-respected and one of the top teams in the Midwest each year, and the Mustangs are looking forward to the challenge. For more information on the Indiana Mustangs, contact Rich Castanias at (317) 379-4669. This entry was posted in Indiana Mustangs, Uncategorized. Bookmark the permalink.